Tonnages: 13,532 gross 7,687 net 21,870 deadweight. Cargo Handling: Fitted with four electric hydraulic deck cranes of 10 tons SWL suitable for grab handling. Engine: Horten Sulzer 6 RD 76 oil engine. 9,600 bhp. 15 knots. 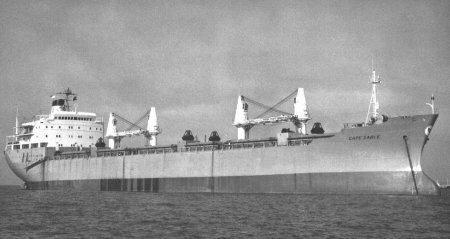 December 1968: Completed by Marinens Hovedverft, Horten (Yard No.163) for Lyle Shipping Co. Ltd., Glasgow. Scottish Ship Management Ltd., Glasgow, managers. 1978: Sold to Marvista Navegacion S.A. Greece flag and renamed CAPTAIN NICOLAS Sold to Primroads Maritime Ltd., Sitinas Steamship Co. S.A. managers, Cyprus flag, name retained. 1992: Sold to Cosmic Ltd., Intertrans Shipping Ltd., managers. St Vincent & Grenadines flag, renamed CAPTAIN. Arrived at Alang, India, 15th June to be broken up by Madhav Industrial Corporation. Commenced Work 29th July 1992.